Let us begin this week`s views by looking up at the skies first. What is seen is not a pretty picture. The skies are dark and foreboding.. The week begins with a square of Pluto in Sagittarius with Rahu in Virgo and Ketu in Pisces.Already we have seen the destabilising effects of this aspect-The French shoot out and the resultant uproar..Western leaders are gathering in Paris and an estimated 1 million people are about to gather to express solidarity with the people who were killed by the terrorists. Already the event is assuming great importance in the annals of terrorism in the world. The reaction seems to me to be far greater than the event itself. French Police are on maximum alert. Do they know something which we do not know? Being slow moving planets, Pluto, Rahu, and Ketu will continue to be in aspects for a while. Even more ominous is that Uranus will join them by January 21. Already volatility is at a high in major markets of the world. Venus and Mercury have been travelling together for a month now and from the weekend, Mercury will slow down in preparation for his retro movement from January 22 onwards and Venus will pull away. They tend to hold the market together when they are together and when they separate, financial markets tend to react. Later on January 12th, Saturn ( as if we wanted this guy also activated!) in Scorpio begins to square Mars in Aquarius. The same day Mars will trigger the Blood Moon point of October.Aggression put down by cold, strict disapproval! And Mars will react. This tends to pull down the markets and by the time Moon meets Mars on January 24, mostly before that a trough is likely to form. By January 19th, Mars meets Neptune in Aquarius and all kinds of rumours will begin to float around and take a toll on volatility. 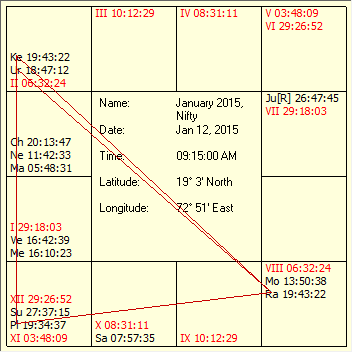 Rahu Venus Jupiter periods tend to give the market a lift up. But with a Venusian tail additionally and with Venus in Moon, I think the upmove may lose steam fast. To sum up astro is indicating that because of these heavy aspects Nifty may come down till January 14th, and improve in the last two days.However, more negativity seems to be in store next week as well. 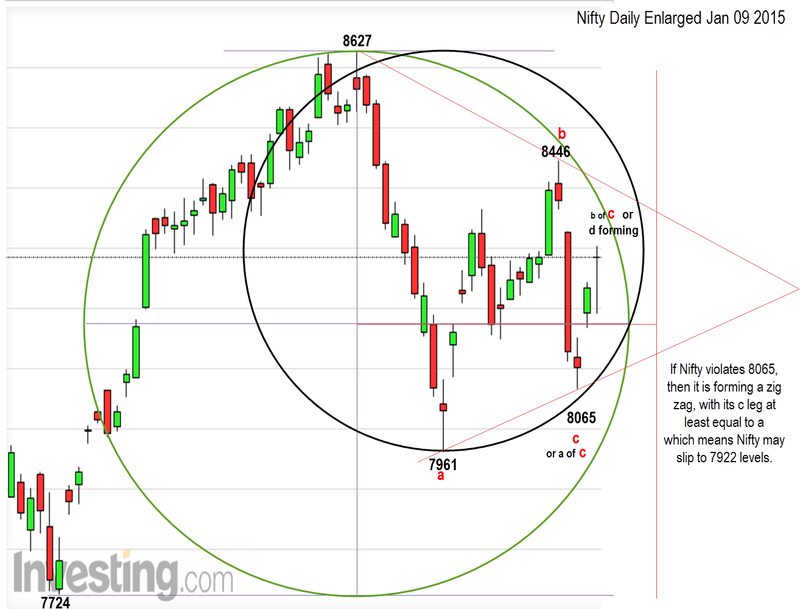 Nifty has broken below the trendline connecting the two Xs.Wave b of b seems to have been completed and we are in wave c of b.This has one more downleg if b is a zigzag. We may also have a horizontal contracting triangle forming in wave b. If so the current upmove from 8065 is wave d and it may not reach 8446. 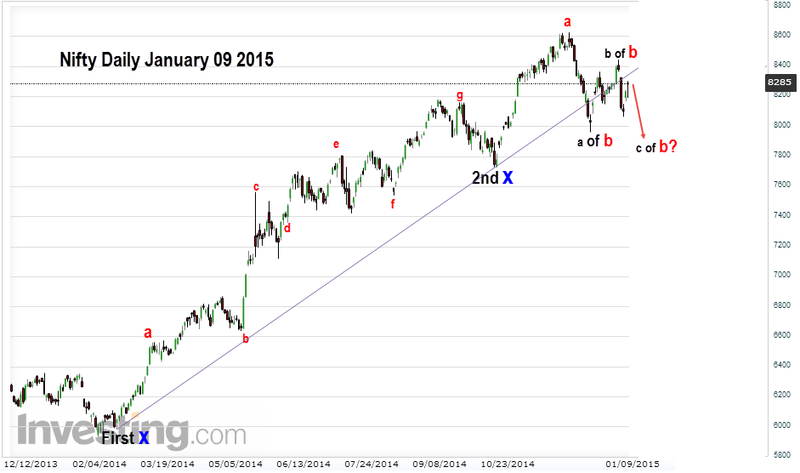 Then we may see wave e downwards, going into the apex. 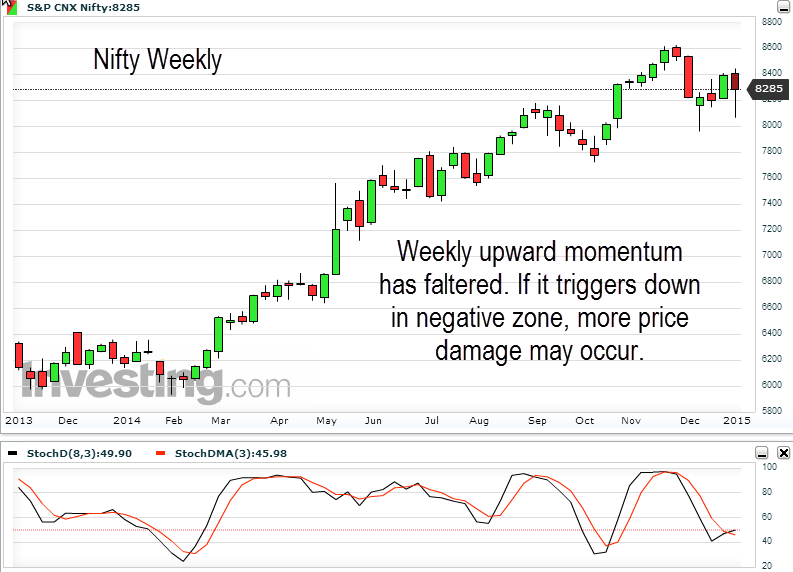 Volatility has to considerably reduce for such a triangle to form. Looking at the astro picture, Iam a little doubtful whether the triangle formation will continue. Alternate is the first option, where wave b of c terminates at the current closing of 8285 and wave c of c begins down on Monday, violating 8065.. So we have an interesting week ahead. My bias is a negative for a low formation and improvement towards the week end. Next week maybe we have another low ( double bottom or lower low) after which the much expected wave c upwards may begin. This might well happen when Mercury is well and truly retro. Current aspects are personally bothersome as well. Please keep your cool, drive safely and above all, operate only with stop losses. A wonderful Pongal and Makara Sankranti wishes to all my dear friends! I have replied through the posts today. Please check. Mr Bala, Mr Tekkie Suresh has clearly mentioned "To sum up astro is indicating that because of these heavy aspects Nifty may come down till January 14th, and improve in the last two days.However, more negativity seems to be in store next week as well. "So the markets acted accordingly. However the rise was phenomenally high and totally unwarranted and unexpected.